Enjoy the summer’s fruit bounty straight, in fruit salads, yogurt, pies, ice cream, smoothies and … green salad. 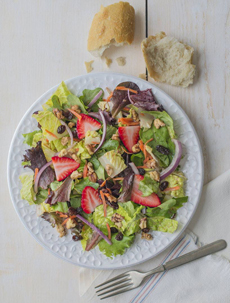 Strawberries or watermelon salad plus greens and feta or goat cheese are time-honored additions to a green salad. But you can create your own recipe. For a July 4th salad, how about a red, white and blue green salad with raspberries, blueberries and diced applies? Instead of the apples, use feta or goat cheese for the white component. You can use a conventional vinaigrette recipe or a berry vinaigrette, adding a tablespoon of puréed berries to the recipe. Strawberry Fields forever? Well, for about 15 minutes until you’ve finished the salad. Photo courtesy Souplantation. For a creamy dressing, add a tablespoon of sour cream or Greek yogurt and combine in a blender.